Would you like to make a very flavorful -- and gleefully sloppy -- meal? If so, then try “The Humble Shepherd,” from Allrecipes.com. 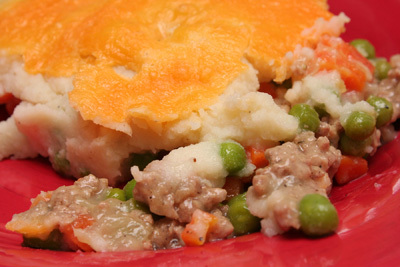 To quote Wikipedia’s definition, the term “shepherd’s pie,” also known as “cottage pie,” refers to an English meat pie (beef or mutton or lamb) with a crust made from mashed potato. This was a food of 19th century, poor, rural workers (who lived in “cottages”). Potatoes were affordable and could be combined here with leftover roasted meats. The recipe that I made asked for ground turkey, which I found appealing. A trendier term for “mashed potatoes” might be “comfort food” (rather than “poor-people food”), but I just think they’re a guaranteed crowd-pleaser. The warm, smooth embrace of a tasty blanket. I boiled my potatoes for 20 minutes. When I mashed them, I poured in the whole cup of milk, but this was too much. My mashed potatoes were too thin. Don’t be as careless as I was. Make sure to drizzle your milk in until you reach the desired consistency. I cooked my turkey and onion for 14 minutes, adding 1 1/2 tsp. salt and 1/2 tsp. black pepper. I did find and use an “instant chicken gravy mix” in my Food Coop. It definitely contributed to the great taste of my final dish. Frozen peas and carrots are another family-friendly convenience food, simple to use in a flash. I grated some fantastic New York sharp cheddar. I baked this for 25 minutes. We all loved it. Let’s step away from these meaty pleasures, and enjoy a vegetarian meal, next time. I want to prepare the “Mediterranean Grain Salad,” from the January/February 2009 issue of Everyday Food, along with “Roasted Cauliflower in Lemon-Tahini Sauce,” from the October 2006 issue of Vegetarian Times. See my results when you return to my site on Thursday, June 4.